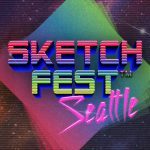 Once again SketchFest Seattle comes roaring back to Theater Off Jackson for two weekends of hilarity. And once again I host this Comedy Film Challenge, for the first time in its new home at Central Cinema. SketchFest Seattle 2011 again took place at Theater Off Jackson in Seattle’s International District. And again I programmed and hosted the Comedy Film Challenge. For a list of all finalists, head on over to the Film Challenge page at sketchfest.org.